The MIDI specification requires an opto-isolator to completely isolate MIDI connected circuits. The USB cable did not have these parts populated and used a common ground for signal transfers. Rock Band keyboard probably was not expecting this. No wonder it did not work! Soldered opto-coupler in U1 and it was a perfect fit for the pinout. I only had to shorten the pins to mount it as close to the board as possible. The case fit back perfectly, though required some glue to hold in place and MIDI-OX finally came to life! This USB MIDI cable might be a cheap and quick way to add USB enabled MIDI for Arduino, but I’m really wondering if it would have worked with any MIDI device at all due to incorrect wiring. You get what you pay for: some self assembly may be required. 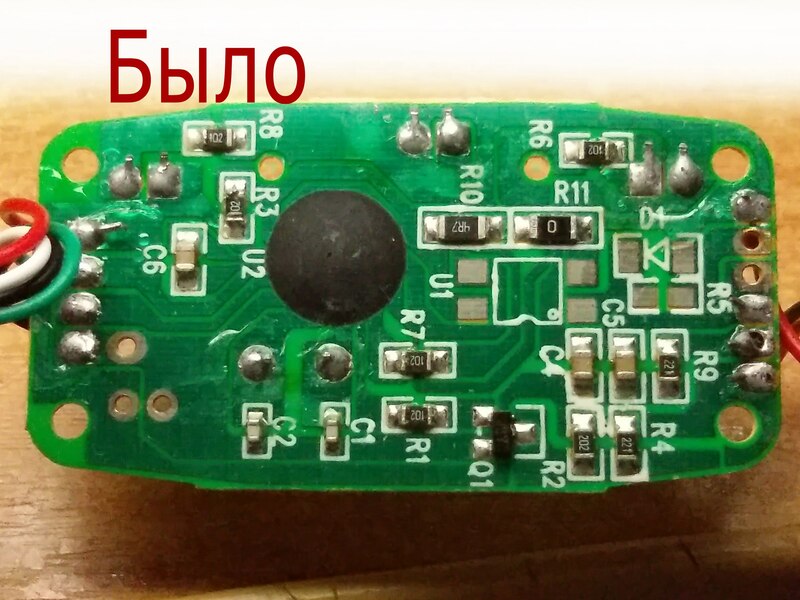 There are a lot of model of this cheap usb 2 midi converter, I bought nearly every models and try, only one model can work, finally I decide to make my own converter using the ch345chip, no more missing component, should work fine. I was pulling my hair out, opened my device like yours and found like yours no opto coupler fitted, fitted like you on breadboard all working. i used a 6N137 because that’s all i had in stock. Hi, VERY USEFULL tech solution! Also my cheap USB2MIDI cable (from China) has the same problem. But also here I have only the opto-isolator 6N137 that has got 8 pins. Can anybody help me understand if the following connections are correct? In fact the optoisolator 6N137 has 8 pin (4 per side). 6n137 is very fast (ton and toff in nsec), but it is an 8 pin chip. Did you have some problem to install it? I have pretty much the same device, but I notice that mine is missing another component. I think it might be a capacitor, the component is usualy found on the back side of the circuit board and is marked C3. Can anyone please possibly tell me what cap I’m supposed to use there? Thanks in advance. Thank you! Have just ordered the Maplin component and will have a bash at this. Thank you very much for posting both the maplin link and the photos – very useful. I seem to spend my life soldering tiny things these days!! PS when you say you got rid of R11 did you also bridge the pads or just remove the resistor? To add to my last comment, yes, you need to bridge R11. If you don’t you get all sorts of note-off messages which are on different octaves and sometimes different notes / channels. I think one person mentioned this. Anyway, if you have this issue, just bridge R11 as well as doing the other stuff. Are you sure? I am looking at picture of forward post (last for now) of firehacker and I see no bridge on R11. So please who solved can say please if the bridge is necessary? If you’ll make the bridge you’ll bypass the opto and you will send incorrect current direction, so no, you don’t need the bridge. I recently bought two of these adapter cables, both labelled differently, but using the same PCB with no opto-isolator fitted. Before I go to the trouble of ‘upgrading’ them, can anyone tell me why the none of the USB ports on my new HP desktop don’t fall back gracefully to work on these and many other USB 2 devices which I own? Even the two ports which are labelled USB2 suffer the same problem. Use a passive usb hub on those ports. I own a cheap (Chinese – sigh) USB ASP adapter that does not work on any port of my laptop as long as I do not connect it via a cheap (Chinese – grin) usb hub. It seems that it does not only violate MIDI specification (absent opto-isolation), but corrupts SysEx messages sent via the converted as well. So you can’t upload patch dump into your synth from your PC, for example. Going to connect my oscilloscope and check what happens to SysEx messages right now. Hello, thank you for the very informative post. I recently purchased a cable identical to yours. The circuit was exactly like yours in the first picture. The only differance is, mine has both a midi in and a midi out cable. When I first connected it the device I connected to my PC (A Pod 2.0 in case that matters), could send data to my PC but it would not receive anything. I tried your solution above but desoldering R11, even though I connected everyhting else as shown, broke the out connection as well. The In connector is soldered to the IN- and GND connections, while the OUT is soldered to D+ and D- connections. Note that I need to connect the OUT cable to the IN connection of my device etc. Any suggestions on if and how I could make this work would be great. The pair of wires going to MIDI IN jack must be rewired: one wire to IN–, another to IN+. 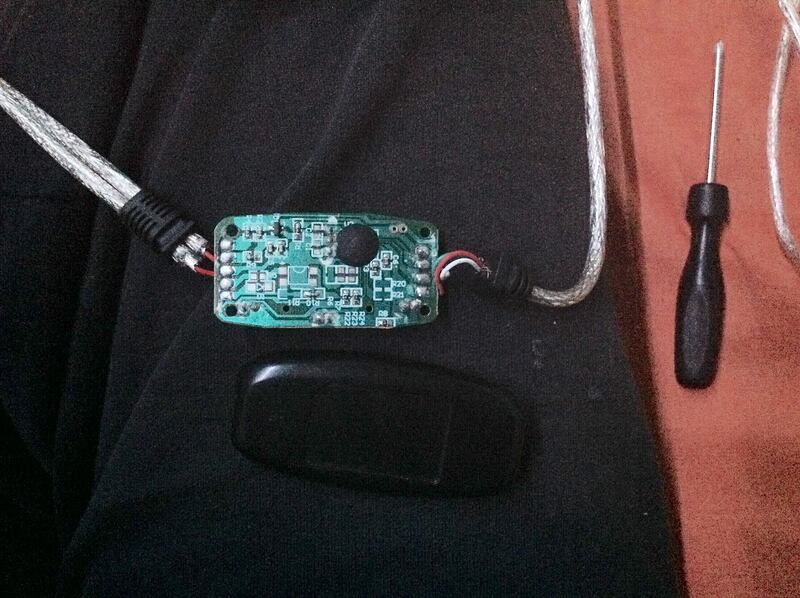 Nothing should be connected to GND, connecting to GND can damage your music equipment in worst case. R11 must be desoldered, U1, R5 and D1 have to be installed. I have just fixed mine. for me the fix did not working. The only difference is in opto PC817 (Maybe this component is not fit for this purpose?) and I haven’t used diode D1. Ah thanks I’ll try that. What did you solder in ? What did you solder in D 1… it was cut out from my previous comment somehow. 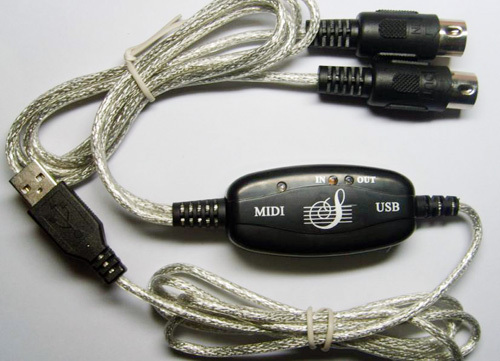 it also does not appear as USB 2.0 Midi but a USB A device among the midi devices. Mine is same problem: PC to keyboard is okay, but keyboard to PC is not functioning. If anyone knows which I ‘ve done is wrong, please kindly give a post. Hi, I know exactly what’s your problem: 817 is too slow. It cannot handle the Midi frequency ( 31250 rate ). hi there, thanks for your comment, I’d try it this weekend. Hi, ResidentEvil… did it work for you change the opto isolator for any of the suggestions of Siro? I use PC817 as well, still not working (the fix managed to get data sent to MIDI-OX, but the data is still wrong). Can’t find any info in the datasheet about how much bps it can handle, how did you know that it was 817 that’s causing the problem? Siro massive thanks! I changed the optocoupler to PC123, and it works fine! for anybody in need of an explanation (kinda), you can google PC817 and PC123 datasheet. There is a graph with resistor value in x-axis and RESPONSE TIME in y-axis. 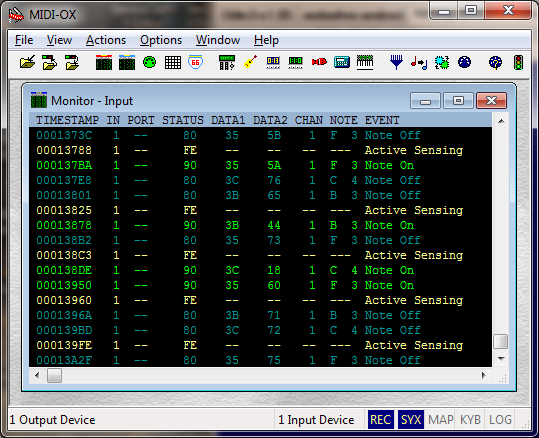 You can see that PC123 has less response time (faster) than PC817 with the same resistor value. Somehow it makes PC123 able to communicate in MIDI data rate (not sure if I’m using the right words, also can anybody do the math? ), while PC817 can’t (has errors I described in my previous comment). Confirmed. Using the PC123 the cable works perfectly. Hi Siro, i can not find any of those elements, is it ok to go with SFH620A-3 ? This adapter doesn’t work with all devices. I have two pieces, one equipped with a SFH618A-2 and one with a 357T. Both are working fine with a new Thomann DP25 but receiving only crap with a old Roland E20. This one works fine with all tested devices. OMG! You saved me. I have been *plagued* by the fact that one of my MIDI devices just wouldn’t work with my cheap generic USB MIDI cable – all my other ones work fine… and further… *from* my computer works fine to the device in question, but the *output* from this one device doesn’t. I saw your post and cracked it open… Identical!! Now I just need to get the right components. There is 5 volts in MIdI IN connector pins 5 and 4 when there is not optoisolator. And no voltage when there is an opto-isolator. There are two power supply, one is the PC 5 volts which feeds the interface through the USB port, and the other power supply is the 5 volts within the MIDI encoder, which may comes from a wall adaptor. This 2 power are floating one to each other, they do not share a common. But the cheap interface couples the signal by 2 resistors, so it needs that the two power supply must share the common. That could be the problem on cheap interface. I will try to join both common by a third lead in MIDi IN cable and will see. Can you please show a picture of your wiring? I have read through the article and the posts. I got quite confused by the variations in components and results obtained. R11 – To bridge or not to bridge? D1 – yes/no? what component is it? value? Wiring – which colour goes where? Can we have clear final photos of the board, components used and correct wiring for those that did work? The problem is that resistor coupling instead optoisolator needs both power supply, Midi Source and Midi Interface shares the same ground and this is not happening in cheap devices. The black wire connected to “G” is coming from pin 4 insted pin 2 in Midi In connector. Usually Midi Sources female connector has a ground in pin 2. 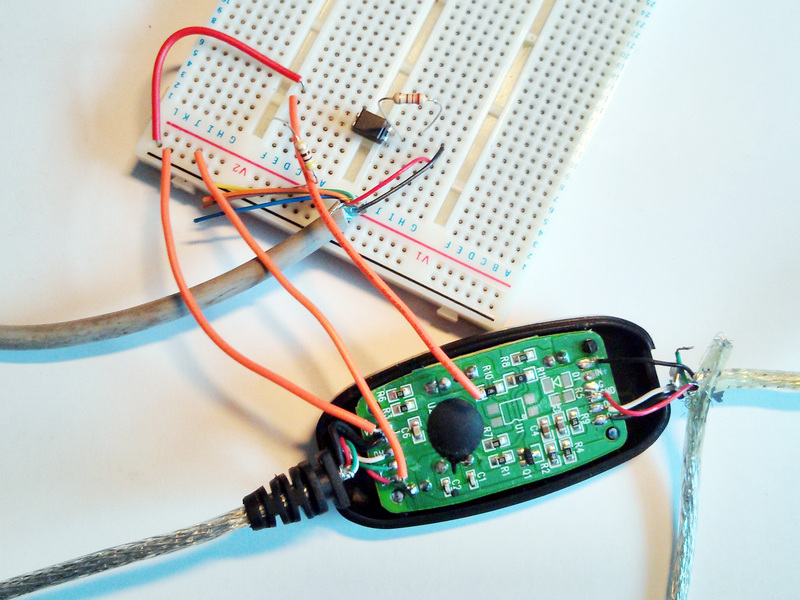 So don´t do anything inside interface and just make a jump between pin 2 and 4 of MIDi IN connector wraping a small piece of wire and then pushing inside. I cannot put images here. I have the same cheap CH345 midi adapter and it isn’t working either (the OS sees it though). It’s not identical to yours but it also has the U1 trans-optor missing. Could someone please take a look at these pictures here: https://imgur.com/a/9AXAI and tell me how to make this thing work? Thanks. 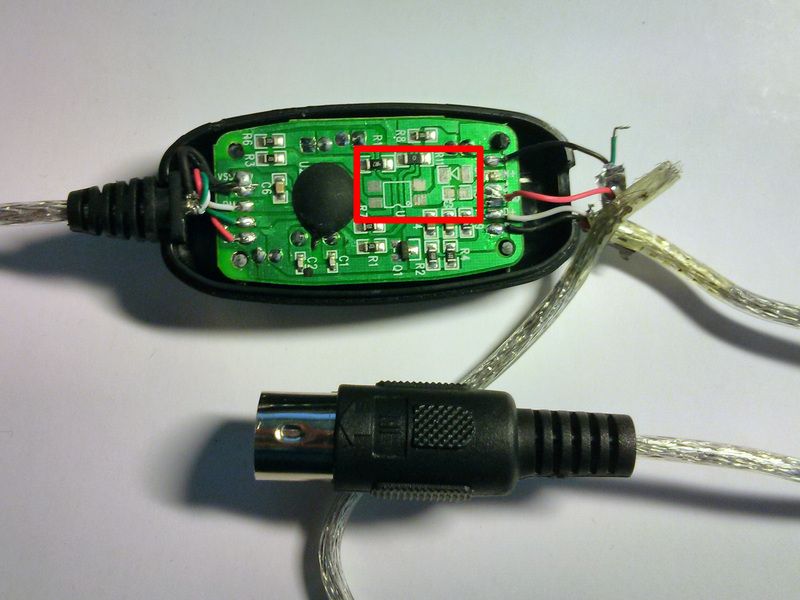 Black wire soldered to “G” is coming from pin 4 MIDI IN male connector and should be coming from pin 2 . Try to make a jumper between pin 4 and pin 2 . It is not easy but someone did it and it worked OK. In my case, pin 4 MIDI IN male connector is the black G and pin 2 MIDI IN is the red one, soldered on IN-. It doesn’t make any sense to connect both. 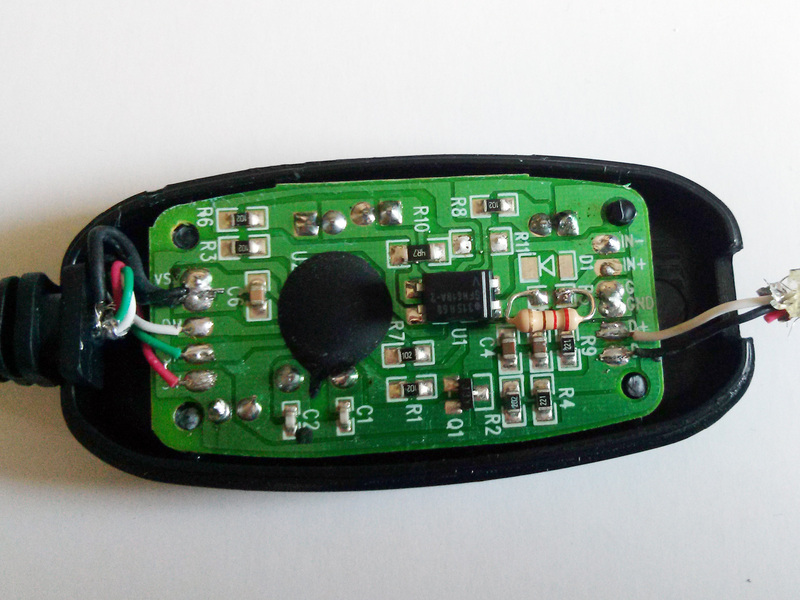 The USB GND black wire is common to this MIDI IN G black one, but I don’t have a optocoupler, nor diode, nor R11 in the board, just R10 going to the main chip. And to make things worst, I only got a PC817C in hands to try. Thank you for posting! Very helpful. I have come across the same situation as you with a cheap chinese USB MIDI controller based on the infamous CH345 chip. 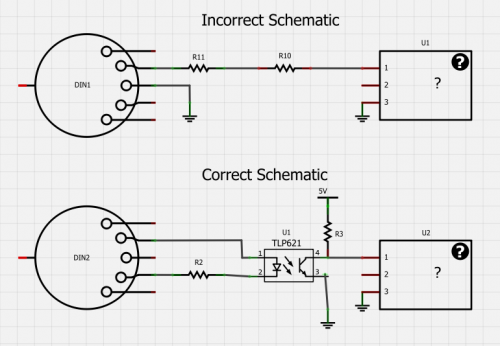 Before you perform any modification on your PCB, I would recommend that you understand the fundamentals of an optocoupler. The output of an OC is basically a transistor which Base is fed by an emitting diode. Now, this transistor will work only if its collector is powered through a resistor from USB +5V. If this resistor is not installed the OC will obviously NOT work. 1) There should be no common ground whatsoever between keyboard side and USB side, the purpose of an optocoupler is to get things fully isolated one side from the other. 2) Make sure that Pin 3 (normally, please check datasheet of OC) is fed by something like 1K or 2K ohm. I believe 1K is enough. On Joseph’s picture, it does not appear very clearly, but it seems to be R3, please inspect carefully, I may be wrong from the distance with only one picture. 3) Systematically install a protection diode (1N4001, 1N4004, 1N4007, 1N4148, whatever) in parallel to Pin 1 and Pin 2 of the OC. 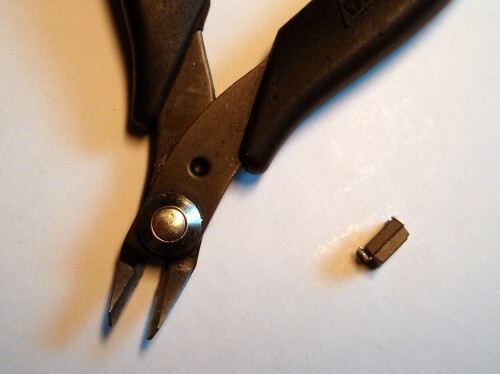 3) Install a 220 ohm or 330 ohm resistor to feed the emitting diode of the optocoupler. Personnally, I have put approx. 300 ohm that allows about 5mA through the emitting diode of the photocoupler, and with a CTR of 100% I have approx the same current through the transistor, which is enough to saturate it with a collector resistor of 1kohm when MIDI signal come in. 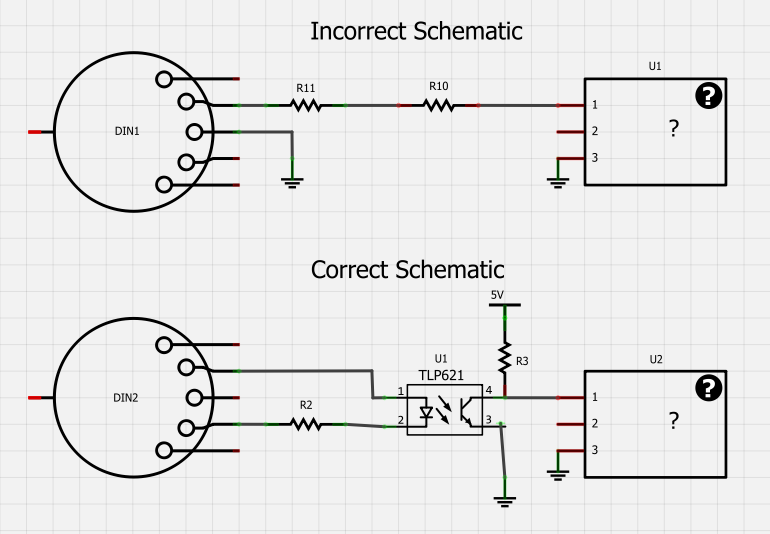 4) Make sur that the input wires are properly connected to IN+ and IN- only and this, the right way (not in a reverse way, or it will not work) Please remember that MIDI output and OC output are opposite logic. 5) Nothing should be connected to GND for at least 2 purposes : a) isolating MIDI side from USB side and b) avoiding ground loops. And it should work, probably whatever the OC is, i.e. PC123 (works for me) or PC817 or EL357. 1) In order to better fulfill Midi standard, I installed 220 ohm instead of 300 ohm to feed the diode of the optocoupler. 2) For final version I have now installed an SMD EL357 optocoupler instead of temporary through hole PC123. 3) It appears that feeding the transistor of EL357 with 1K or 2 2K does not allow the interface to work properly. I’ve had to go down to about 250-400 ohm in order to achieve a good and stable output from the interface. I finally installed 330 ohm. 4) I have cut some traces and performed some wire bridging in order to have the right lighting of LEDs with reference to the indications on the front side of the interface (i.e. Power on, Midi In and Midi Out). Caution : there was originally a resistor on R10 (in line with R11=0 ohm), that resistor was supposed to compensate for the absence of optocoupler. I obviously removed this resistor when I decided to put an optocoupler instead. I came from Poland and my english is poor. I want to thans All users on this forum but especially thaks you – Pierre. I have the same elements missing as You. 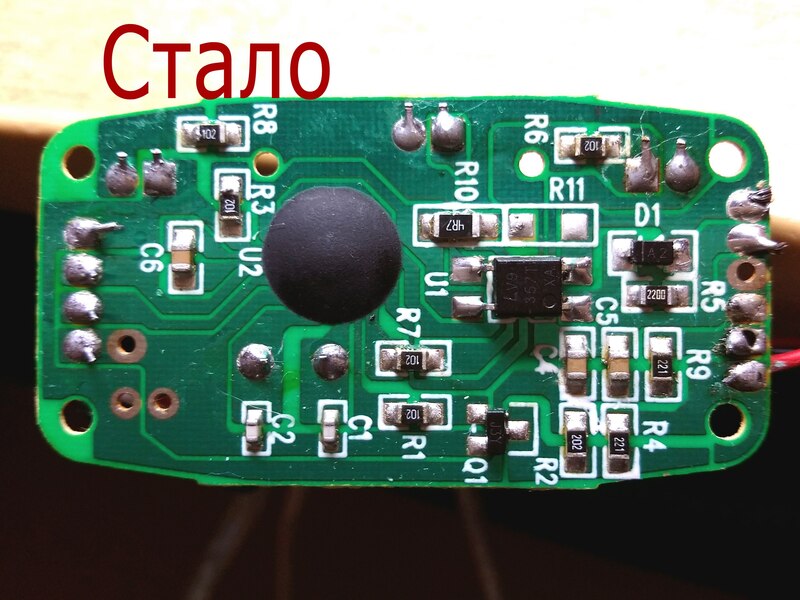 In this midi controller light red diode and no work, but OS (Windows) on computer detect properly after plug into. I wrote this message, because instead optocoupler EL357 I’ll experimentally insert element as number 480 (in electronic shop EL357 was absent, so I will take that). Properties of diode and resistors I will take from Pierre secondary post. I’ll cut off “+” path to red diode and link “+” this diode to R6. First I’ve try to not cut off this place, then controller work totally incorrect. Now this controller is working good, don’t mess messages between midi keyboard to computer and not have delay. Middle diode (blue) squint when I play. So, one more I want to thank You for instructions. Now I am happy. I do not understand the first attempts, those with the cables. Is it possible to works with no chip? Trying to read data from Device Monitoring Studio see nothing, the device do not send any data only when connect/disconnect. -It’s amazing how this post was from 2013, but still has interest from people in late 2018 (and probably 2019 too lol). God bless this website. So what is the final solution? Put an optocoupler or simply jumper pin 2 and pin4? Thanks for posting. Explains why my older “chea p” worked – they had an opto-coupler and were wired correctly plus could handle some long Systex (800kb broken into 512 byte buffers) and later versions didn’t work – you guessed it (exactly same as above). so far so good – sure the note off gets lost occasionally BUT I am flooding the midi with poly aftertouch – it would crap out almost immediately without the mod. And I am much happier the cable is more like the midi standard proposed by Dave Smith. I saw in a different website possibility to use the USB side to link to an Arduino so that the UART from Arduino can get in the fun. For sure I will be looking into this. Else I will cut my losses and try Digikey to emulate midi USB. thanks again for your original post – much appreciated.